Microsoft has released the first CU (Cumulative Updates) for RTM version of Windows 10 Fall Creators Update v.1709, which the RTM version has the build number of 16299.15. 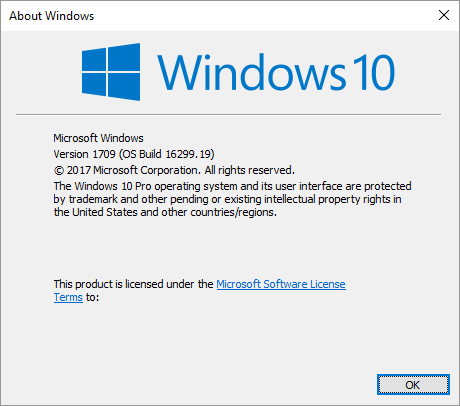 The KB4043961 updates the build version of Windows 10 v.1709 to build 16299.19. If for some reasons, you’re not offered the KB4043961 Cumulative Updates even though you’re an Windows Insider, or you installed Windows 10 Fall Creators Update via Windows 10 v.1709 Media Creation Tool and are not joining Windows Insider program, or have opted out of Windows Insider program, the following tutorial guides you on how to install the KB4043961 CU manually. Microsoft has published the MSU version of KB4043961, which could be executed directly by simply double-clicking on it, without the need to use DISM command. Open an Admin Command Prompt. Restart the computer when installation is done. And that’s it. Welcome to the more reliable and lesser bug build of Windows 10 Fall Creators Update v.1709.